Cape Town 2020: We’re Cruising to South Africa! Home/Destination Immersion® Experiences Blog/Cape Town 2020: We’re Cruising to South Africa! Have you heard the news? On May 15, we revealed our 2020 itineraries—and they’re spectacular. Among the many incredible destinations we’re set to visit is Cape Town, South Africa. Nestled near the southernmost point on the African continent, Cape Town is a vibrant, cosmopolitan city surrounded by a stunning natural landscape of striking mountains and pristine beaches. Just outside Cape Town are the Cape Winelands. It’s the country’s largest wine region and offers six distinct wine routes to explore. The three most famous towns along these routes are Stellenbosch, Paarl, and Franschhoek. The entire area is a sight to behold, with towering granite mountains and lush valleys peppered with vineyards. Azamara guests will be able to visit some of the region’s best wine estates, as well as local cultural monuments, during our Cruise Global, Taste Local shore excursion. Cape Town is also a foodie’s paradise. It’s been named the best food city in the world by Conde Nast Traveler and offers an eclectic mix of traditional South African fare and globally-inspired cuisine. Don’t miss partaking in a braii (South African’s answer to barbecue), dining on game meat, and trying Cape Malaya curries. South Africa has a long history with both troubling and uplifting elements. You cannot talk about South Africa without also speaking of Nelson Mandela and his role in South African politics, history, and culture. The best way to dive into this history is by visiting Robben Island. The iconic island, located less than seven kilometers off the coast of Cape Town, formerly housed a prison and is now a UNESCO World Heritage Site. Nelson Mandela was jailed on Robben Island for 18 of the 27 years he spent as a political prisoner during the Apartheid era. Today, former prisoners operate poignant, enlightening tours of the island. Tours of townships surrounding Cape Town (Khayelitsha, Langa, and Gugulethu are the most famous) will introduce visitors to modern local life in South Africa. Visiting craft markets, dining at small, family-run restaurants, and learning about local youth programs are a great way to gain a deeper understanding of everyday life. Street art is alive and well in Cape Town, and a great way to immerse yourself in the city’s culture. The suburb of Woodstock is one of the most popular places to see street art, but you’ll also find it in the city’s District 6 neighborhood. Arts and culture lovers should also head to Bo-Kaap for its photogenic, colorful houses, trendy art galleries, and famous Bo-Kaap Museum. Music fans will love Cape Town’s vibrant nightlife scene. The city’s longstanding hub of nighttime fun is Long Street, a main artery that cuts through the city and is peppered with shops, restaurants, and bars. It comes alive at night thanks to lots of live music and street food vendors. Cape Town is a big, bustling city with some of the world’s best outdoor adventure in its backyard. 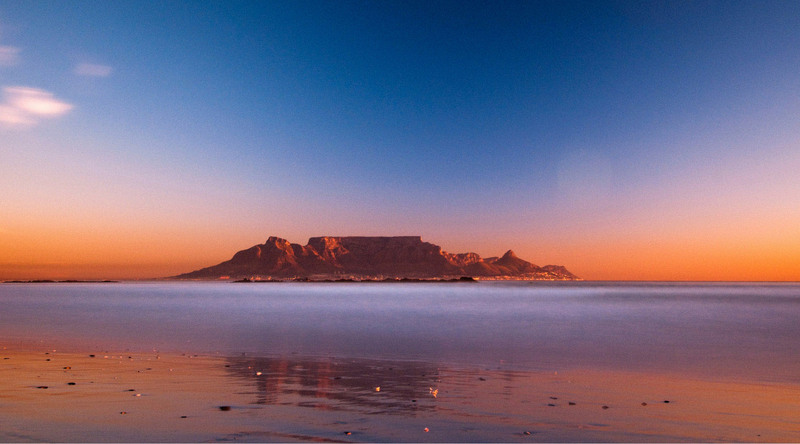 Just look at Table Mountain, the aptly named flat-topped mountain that overlooks the city. You can hike or bike Table Mountain, or take the cable car for a more relaxing endeavor. Situated between two more iconic mountains, Lion’s Head and Devil’s Peak, the three mountains are home to beautiful flora and fauna as well as breathtaking views of the city. Down below, the trendy and upscale neighborhood of Camps Bay is home to one of the world’s most beautiful urban beaches. The most famous beach near Cape Town, however, has to be Boulders Beach in the suburb of Simon’s Town. It’s home to a colony of adorable African Penguins, with a population of between two and three thousand birds. Don’t forget to make a stop at Cape Point on your way there, so you can set foot on the southernmost point of Africa. For the most adventurous travelers, there are plenty of activities in and around Cape Town that will get your adrenaline pumping, like paragliding, cage-diving with sharks, and bungee jumping. Our new African cruise itineraries will bring guests to many incredible ports beyond Cape Town. Port Elizabeth offers a smaller, sleepier atmosphere than Cape Town. It’s a delightful entryway to the region’s main event, Addo Elephant National Park. The park was created in 1931 to protect the eleven remaining elephants in the area. Today it’s home to more than 600 elephants, as well as other animals like lions, buffalo, zebras, warthogs, and black rhinoceroses. Guests can explore the park during an exciting 4x4 safari tour. Just outside of Port Elizabeth, the Pumba Private Game Reserve and the Sibuya Game Reserve offer further opportunity to get up close and personal (from a safe distance, of course) with local South African wildlife. Port Elizabeth itself is a charming town worth exploring. Through our unique shore excursions, guests can get to know Port Elizabeth’s craft beer culture, captivating art galleries, and historic architecture. Durban is a laid-back city on South Africa’s east coast that’s known for golden, sun-kissed beaches, travel-worthy surfing, and captivating cultural experiences. It’s the country’s third-largest city and the capital of the KwaZulu-Natal province. In the townships and villages surrounding Durban, Zulu cultural traditions are alive and well. Durban is home to the largest India population outside of India itself. The city’s Indian Quarter is where you’ll get to taste fantastic Indian cuisine, including the South African staple “bunny chow”. (The dish, funny enough, does not contain rabbit. It is essentially a hollowed-out loaf of bread filled with curry.) The blending of Asian and African influences gives Durban a unique cultural identity that makes it one of Africa’s most interesting cities. We believe one of the truest joys of travel is getting to meet new people. How else can one hope to understand local culture, after all? From the charming surfers’ paradise of Richard’s Bay, guests can embark on a Cruise Global, Meet Local shore excursion to Shakaland. Shakaland is a Zulu Cultural Village that showcases Zulu traditions in art, handicraft, music, dance, and cuisine, as well as elements to everyday life. From Richard’s Bay, guests can also partake in an adventurous game drive and a wetland wildlife tour. Our 2020 adventure doesn’t stop in South Africa! We’ll also be calling on ports in nine other African nations, including Kenya, Madagascar, and Mozambique. Stayed tuned for more travel tips, stories, checklists, and more as we look ahead to what’s bound to be the adventure of a lifetime. Want to know more about upcoming itineraries and cruise deals? Stay in the know by signing up for emails from us! And, of course, don’t forget to start browsing these incredible voyages. We can’t wait to welcome you aboard.